One of the best plumbing appliances that we have in our homes and businesses is the water heater. A water heater is able to provide you access to water straight to the tap, as well as make day to day chores so much easier. If you currently have a water heater that’s in fine condition but you are looking to upgrade to a new one, the plumbers at All About Plumbing & Septic are able to help you. Our plumbing contractors are experts in water heater installation in Mills River, Hendersonville, and Asheville, NC, so if you need professional installation for your new water heater, we are here to help! 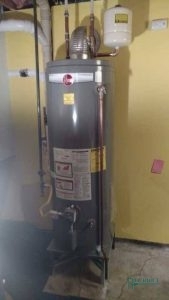 It might seem like it would be easy to install a water heater, but it is actually a lot more complex than it looks. For Water Heater Installation, Call All About Plumbing & Septic! While it might be cheaper to go ahead and install it yourself, there are certain safety standards that you need to meet and because the water heater will either be electric or gas, there is the potential that you could hurt yourself or cause harm to others. It is in your best interest to contact us whenever you need a water heater installation service. We will be able to help you find the best water heater, install it properly, set it to the correct temperature, and give you maintenance advice. Our plumbers can offer gas, electric, and tankless water heater installation, so you can get any water heater you want to be installed by someone who knows what they are doing. To set up an appointment call us at 828-778-2425. Although there might not be anything wrong with your water heater, you still may have thought about investing in a new one for your home or business. There are a lot of reasons why a homeowner or business owner might choose to upgrade to a new water heater, with some of them ranging from the size to the water heater’s ability to heat up water. If you are still on the fence about getting a new water heater installed, here are some situations in which a water heater installation is ideal. Better Energy Efficiency: With a lot of older water heaters, they aren’t the most energy-efficient. By upgrading to a new water heater, you will have a more energy-efficient model. Save Money: A new water heater will help you save energy as well as help you save money. Because it doesn’t use as much energy, you won’t be spending that much money to run the water heater. Avoid a Breakdown: Sometimes people choose to invest in a new water heater a lot earlier because they want to avoid the risk of their water heater one day not working. More Hot Water: Newer water heaters are able to provide you with more hot water. Instead of fighting over who gets the first shower in the morning, you don’t have to worry about that with a new water heater. Incorrect Size: When you first bought your water heater, it could’ve been the perfect size for your needs–things change as well as water needs, so you may want a new water heater to meet those specific needs. If you would like a new water heater for your home or business, call us today to make an appointment for water heater installation in Mills River, Hendersonville, and Asheville, NC. We can help you find the best water heater brand and then install it quickly and efficiently. We Can Replace and Install Many Brands of Water Heaters. At All About Plumbing & Septic, not only do we offer water heater repair and water heater installation service, but we also offer water heater replacements. A lot of times when this happens, its because the necessary repairs and maintenance were not scheduled for your water heater. If you are having issues with your water heater and you aren’t sure if you need repairs or a replacement, you can call us at 828-778-2425. We will come to your home or business and inspect your water heater to see if it can be fixed with repairs. 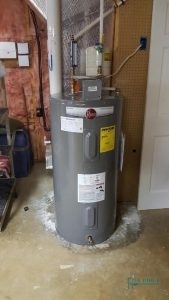 If for some reason it is beyond repair, we can provide water heater replacement service. While this is not something that people are too happy about, it is so important to get a replacement for your water heater when it is needed. With a replacement, you can have a water heater that doesn’t require frequent repairs, and you can have a more energy efficient water heater. Whether you are needing an electric, tankless, or gas water heater replacement, we can help! Get in touch with to get either water heater installation in Mills River, Hendersonville, and Asheville, NC or a replacement. While a water heater replacement is needed on occasion, a lot of times homeowners and business owners don’t know when a replacement is needed. Below are some of the signs that indicate a replacement is needed for your water heater. The water heater is eight or 10 years old. There is rust colored water coming from your tap. There are rumbling noises coming from the water heater. There are leaks at the base of the water heater tank. The water heater isn’t producing hot water. If any of these sound familiar, please call us at 828-778-2425 for help! Whether you need a tankless water heater replacement or a gas water heater installation in Mills River, Hendersonville, and Asheville, NC, our plumbers are the professionals to call. Let us help you have a better water heater for your home or business by contacting our office today. Updated on January 22, 2019 at 12:26 pm by All About Plumbing.